Seeking an individual with strong organizational and analytical skills to assist in the administration of a busy service department. Ideal candidate must have previous clerical experience. Bilingual a plus. South Florida is warm, sunny, and wonderful almost all year round, but there are months when Florida becomes a natural disaster zone. This makes it an excellent location to live, or even to start a business. However, homeowners and business owners alike face a similar fear when hurricane season rolls into town. Hurricanes can shut down local businesses for days at a time, and when a company is shut down, that means that there isn’t any profit coming in, or work going out. This type of standstill can significantly impact the overall performance of a company, and If the business is small, the pause is even more painful. Fortunately, there are ways to navigate hurricane blackouts using the experienced professionalism of Pantropic Power. We offer a temperature control rental in Fort Lauderdale to those in need, so that they can continue running their operations regularly. Here are a few alternative reasons for looking into temperature control units. The number one benefit of a temperature control rental in Fort Lauderdale is that you get to give back the equipment after the hurricane moves on. This ensures that you don’t have to waste precious dollars in order to keep your business up and running. Temperature control machinery isn’t cheap, and it isn’t needed all year round. Therefore, the process of renting is much easier for most companies. At Pantropic Power, we’ve been in business since 1986. Our first store in Miami started out as a little shop, but now we have numerous locations across the state of Florida. Something that makes us a highly recommended company is that we’re the only CAT, or Caterpillar Power Systems Dealing in the area. Our products have a brand name that has been trusted for decades, and their durability is untouchable by competitors. When you’re in need of a temperature control unit, there’s no time for your unit not to work the way it should. When you rent from our business, you’re not only getting machinery that will do the job, but you’re also receiving maintenance and even installation if necessary. In fact, if you foresee your need for power rentals regularly, you can become a preferred rental customer. Being a preferred rental customer entitles you to incredible perks like assistance, being first on the rental lists, contingency plans, business recovery plans, and we even provide temperature control units for those in need after a massive storm. Call our rental department today if you’re looking for a temperature control rental in Fort Lauderdale at (786) 402-5097. When your employees need to come to work, there’s no use in sending them home when you can regulate the temperature of your facility. Beat the odds of Mother Nature with Pantropic Power as your ally. Seeking a self-motivated and mechanically inclined individual to oversee and manage the Field Service Operation. Will be responsible for managing, planning, and conducting activities concerned with the field service personnel who perform on-site routine services including installation, maintenance, and repair. Ideal candidate must have a Bachelor’s degree with a concentration in Business and/or Engineering as well as 10 years of related experience, or a combination of both. Must also have excellent communication and technical writing skills. Bilingual a plus. Seeking an individual that will be responsible for directing the organization’s safety programs to protect employees, vendors and volunteers against harm, and maintain safe working conditions. Candidate will also be responsible for contamination control duties. Ideal candidate must two to five years of related experience and/or training; Program Certificate in Safety; or equivalent combination of experience and education. Bilingual a plus. Looking for Temperature Power Services in Fort Lauderdale? Did you know that if you want to host an event or run a food stand, you don’t need to own your own power source? If you’re out and about, you don’t always want to carry your machine around with you. Not to mention, power sources can be quite expensive! If you don’t need one all the time, why decide to purchase one? Fortunately, there’s a better option for those looking for temporary power services in Fort Lauderdale. At Pantropic Power, we’re one of the most trusted companies in the south to provide energy wherever and whenever. When you’re on the go, you need a team that you can trust to get your company or your event up and running. There are numerous reasons for making Pantropic Power your reliable source of energy. First and foremost, we offer incredible customer care to those renting from our rentals department. We know that in the event of a hurricane or a named tropical storm, your business can suffer dramatically from a loss of power. When your income comes from your business, there’s no time to waste. Therefore, it’s better to be prepared for the worst, primarily as the rainier seasons begin to approach. Our CAT rental options are modern and massive, giving you plenty of selections to choose from. If you’re not familiar with temporary power, we can answer any questions you might have along the way. At Pantropic Power, we can customize a solution that’s easy to use in the event of an emergency or a special occasion. We build specifically to fit your individual needs so that your power source is precisely where and how you need it. If you’re someone who is going to need temporary power regularly, you can sign up to become a preferred rental customer. When you become an advantage customer, you get access to many incredible advantages including contingency plans for disasters, first in line for equipment and fueling schedules, business recovery where we provide temperature control, and maintenance! With so many benefits, it’s hard to imagine why anybody would pass that offer up! Whether you’re looking to host a wedding, graduation, or an outdoor business, Pantropic Power is the company to assist. 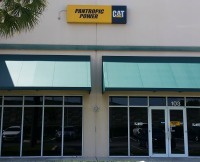 If you’re looking for a more extensive set up to accommodate your business during intense storms, there’s nothing quite like Pantropic Power’s knowledge, and excellent customer care when you need help the most. For temporary power services in Fort Lauderdale, don’t leave your special event or your company’s fate in just anyone’s hands. Instead, trust the only certified Caterpillar or CAT Power Systems Dealer in South Florida. Call our rental department today at (786) 402-5097 and see how we can give you the peace of mind you deserve. In business for decades, we know how to fulfill all of your temporary power needs.